settle for a graffiti painted property when a clean slate is only a phone call away! Street artists are not running around town carrying an easel and paint brush! The most common tool for these artistic vandals is, of course, spray paint. Aerosol paint is easy enough to pick up from various department stores, which makes them enemy #1 for our Gorilla specialists. Because spray paint is so common, easily accessible, and simple to transport – no property is safe from their reach! Public domains are always at risk for unwanted paint jobs but they are not alone. While city services will remove paint from government buildings, privately owned properties are all on their own! Unattached homes have to deal with the odd splashing of paint but commercial and multiunit buildings are prime targets for graffiti vandalism. Maintaining curb appeal and making sure that your space makes the right impression is vital for property owners and quick action does just that. Properly removing aerosol paint is a time sensitive practice – the longer that you leave it, the worst the stain- so don’t hesitate! Having a graffiti stained property is detrimental to your space for several reasons. Street artists are known to be competitive. This competition is not so much centred around quality but quantity is always important. Territory is a major draw for graffiti artists, and what better way than dropping a signature in a visible space? Small designs or ‘tags’ act as signatures for various artists in your neighbourhood. When one artists marks a property, you can bet that others will come to cover up their rivals’ marks and leave their own. Each piece of graffiti invites another. This means multiple tags, layers of paint and tough-to-manage staining. 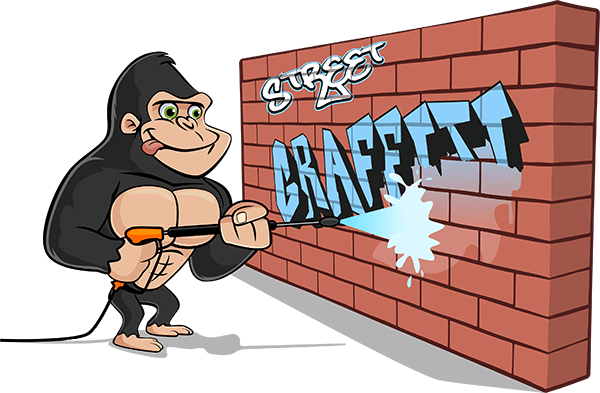 Instead of letting graffiti get the best of you, call a Gorilla for a speedy graffiti removal service. Quick removal does more than eliminates competition, but can reduce the severity of stains as well. Direct sunlight bakes darker stains into the façade of your property. Early removal makes for simple and direct methods. As time passes by, your Aldergrove graffiti removal becomes more involved and more difficult. Luckily, our Gorillas are trained to treat stains at every level of difficulty. Spray paint is easy enough to get your hands on, but it is one of the most difficult stains to remove. A paint-free property might be the end goal, but getting there is a bumpy road. Amateur graffiti treatments have been known to expand stains instead of removing them. Ditching paint at a surface level can leave shadowing behind. Inexperienced tools can also lead to paint bleeding down from its initial stain, leaving streaks and creating a much larger discolouration. By assessing your property and stain before beginning treatment, our Gorillas achieve expert results every time. The Gorilla Property Services approach to our Aldergrove Graffiti Removal Services is a multi-step process that is as involved as your stain is. Some stains can be treated with cleaning compounds and a pressure wash, while others require a bit more muscle. When stains prove to be too stubborn, paint matches are provided for a seamless graffiti cover up.